I'm back with another installment of the FMF link-up for this week! The writing prompt is on Story. I have always loved stories. Growing up, I used to make up stories and tell them to the "little" kids to keep them occupied on our commute to school. As an adult, I find myself even more interested in them, but for a different reason. Not so much for entertainment value anymore (of course that will always be a part of my love for them), but for identifying the essence and heart of people I have come to know. Everyone has a story, a collection of experiences that is as unique as their DNA. The trouble is, not many of us were taught to embrace our story, to value to good and the bad, to own this narrative that cannot be stolen nor denied. I have found that the "me too" ministry is valuable and necessary for healing. When we share our stories, we find community and can embrace and be embraced by others who have walked through similar experiences. It preserves legacy. I love that word and everything for which it stands. I think about the children of Israel in the bible and how they passed down the stories of connection and redemption from one generation to another. It strengthens the resolve of the storyteller. Often shame, issues of worth, and fear keep us from sharing our story. The more we share, the stronger we become. We unshackle the fetters that kept us bound and find the vigor in our bones to keep fighting another day. This time always goes by so quickly! 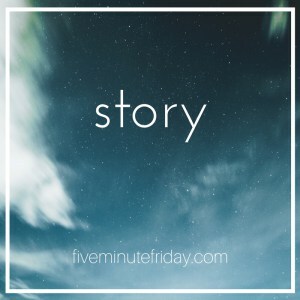 I hope you enjoyed stopping by to talk about story with me! Have questions? Agree or disagree with what I said? Drop a comment below, can't wait to discuss this with you. Have a story that you'd like to share? I'd love to hear it, and maybe even feature it here on the blog.